Distinguished Professor Ron Miles has created a workable sensor with the least possible resistance to motion. 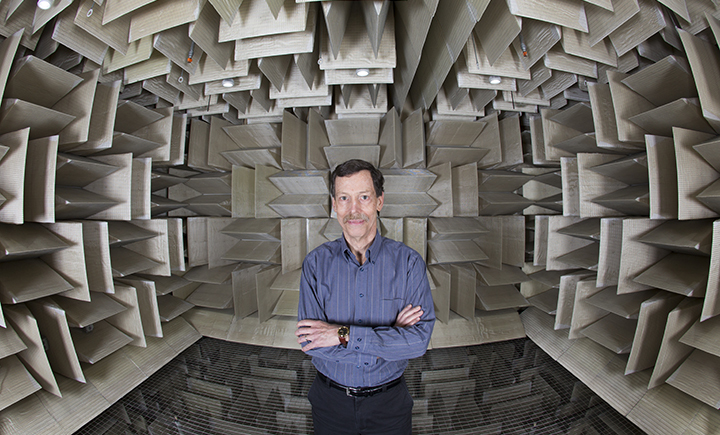 Distinguished Professor Ron Miles in the anechoic chamber, a room designed to absorb sound, where he does acoustic research. As part of ongoing acoustic research at Binghamton University, Distinguished Professor Ron Miles has created a workable sensor with the least possible resistance to motion. The thin and flexible sensor is ideal for sensing sounds because it can move with the airflow made by even the softest noises and addresses issues with accelerometers, microphones and many other similar sensors. It hasn’t previously been feasible to use capacitive sensing on extremely flexible, thin materials because they’ve needed to resist electrostatic forces that can either damage them or impede their movement. “Researchers want the sensor to move with small forces from sound, without being affected by the electrostatic forces,” Miles said. In this most recent work, Miles has found a design that allows the thin, flexible sensor – which could be spider silk or any other material just as thin – to swing above two fixed electrodes. Because the sensor is at a 90-degree angle from the electrodes, the electrostatic forces don’t affect its movement. “Because the sensor is at a 90-degree angle from the electrodes, the electrostatic forces don’t affect its movement,” said Miles. This is a critical part of the design because the sensors need to have a high bias voltage – the voltage required for a device to operate – to be effective since the sensitivity of the sensor increases with a high bias voltage. Miles’s research was funded in part by a grant from the National Science Foundation (NSF) and his functional designs are patent pending. This work has recently been published in the IEEE Sensors Journal.